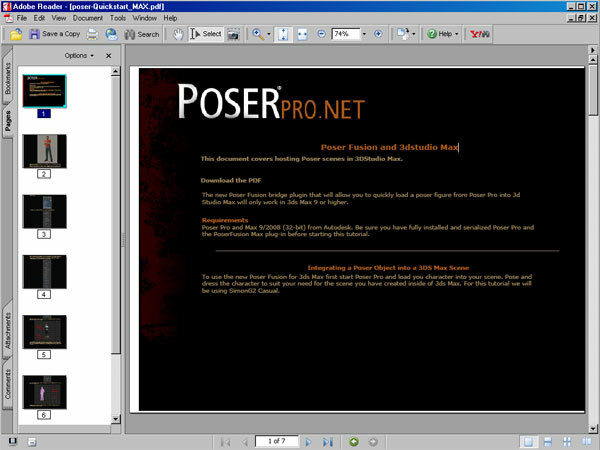 Software expertise: Poser Pro and Max 9-2008 (32-bit) from Autodesk. Be sure you have fully installed and serialized Poser Pro and the PoserFusion Max plug-in before starting this tutorial. The new Poser Fusion bridge plugin that will allow you to quickly load a poser figure from Poser Pro into 3d Studio Max will only work in 3ds Max 9 or higher. Integrating a Poser Object into a 3DS Max Scene. 7 pages, pdf file, 2008.